434 pages | 322 B/W Illus. 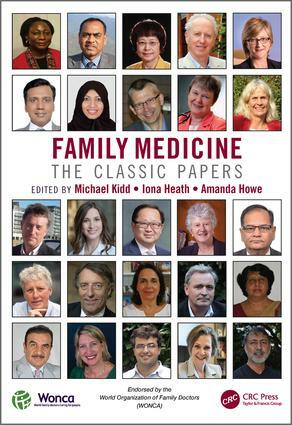 Containing papers carefully compiled for both their historical importance and contemporary relevance, Family Medicine: The Classic Papers brings together a team of experts, led by global family medicine leaders Michael Kidd, Iona Heath and Amanda Howe, who explain the importance of each selected paper and how it contributes to international health care, current practice and research. The papers demonstrate the broad scope of primary health care delivered by family doctors around the world, showcasing some of the most important research ever carried out in family medicine and primary care. This unique volume will serve as an inspiration to current family doctors and family medicine researchers and educators, as well as to doctors in training, medical students and emerging researchers in family medicine. "Don’t miss the advice each contributor would have given to their younger self – there are some gems there that will be of particular use to new starters in general practice who should also find the entire volume a sound introduction to the foundation of their new profession…. Family medicine: The classic papers evocatively details the rich philosophical, scientific and humanistic basis of ourprofession. With its expansive perspective of thought, grab this book, take time out and take stock. Take a journey through the vista of the profession’s wisdom and have a good think. It will make you a better GP." "This book provides an extraordinary view of family medicine around the world and helps emphasize the importance of primary care at a time in medicine when specialty care tends to grab the attention of the media and the public." Professor Michael Kidd is a family doctor, primary care researcher and medical educator and dean of the faculty of health sciences based at Flinders University in Australia.He is a past president of the Royal Australian College of General Practitioners and has been a member of the WONCA world executive since 2004. In 2013 he took on Presidency.